It finally feels like summer! 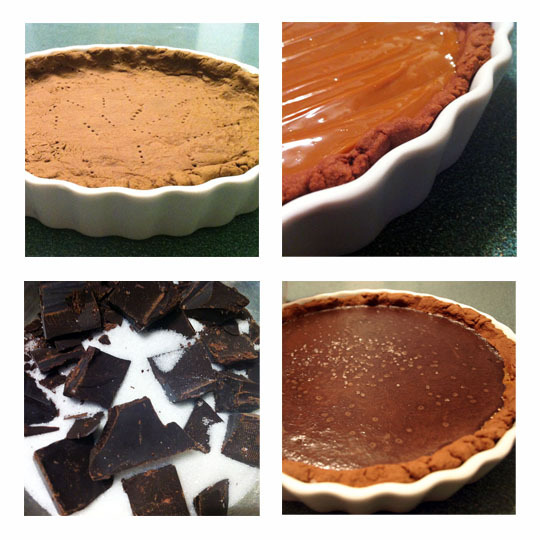 What better to do on a hot summer night than create the perfect dessert for the next day? 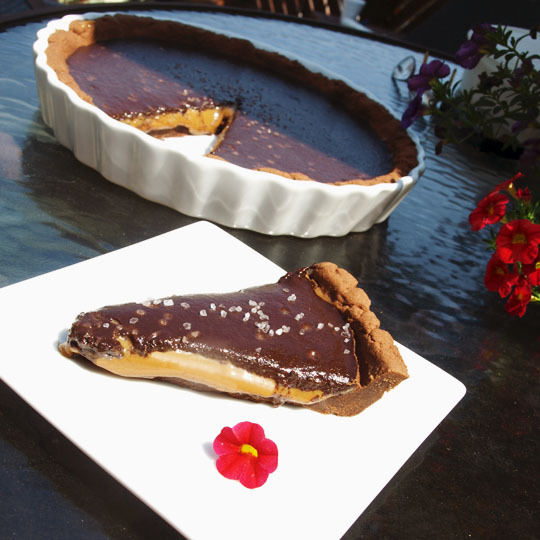 - The caramel filling requires a slow cooker and takes 8 hours to cook. – You’ll need two room temperature eggs and 10 tablespoons of softened butter, so set them out! Click here for a printable shopping list and recipe! 1. Whisk flour (1 1/2 c.), cocoa powder (5 tbsp.) and salt (1/4 tsp.) in a bowl. 2. Cream the butter and sugar in a large bowl until mixture is pale and fluffy, about 3 minutes. 3. Mix in egg yolks (2, room temperature) and vanilla (1/2 tsp.). Add in dry ingredients from step 1. 4. Place dough in a 9″ quiche pan and press evenly throughout bottom and sides of pan. 5. Refrigerate for 30 minutes. Preheat oven to 350˚F. 6. Prick the tart shell all over with a fork and bake for approximately 15 minutes. 1. Place one can (14 oz.) of condensed milk in a slow cooker after the label is removed from the can. 2. Fill cooker insert with water until the top of the can is covered. 3. Heat on low for 8 hours. 4. Open can (SLOWLY) and you’ll find delicious caramel! Spread it across the crust, as seen below. Ganache 1. Bring heavy cream (1/2 c.) almost to a boil over medium heat. 2. 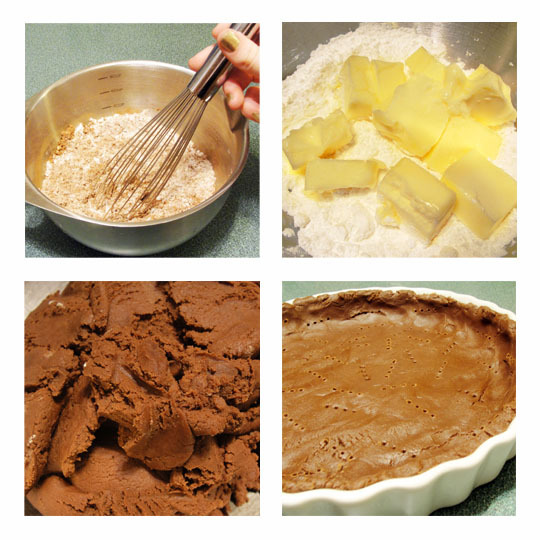 Place chopped chocolate (4 oz.) into a medium bowl and pour hot cream over chocolate. 3. After a minute, stir slowly with a rubber spatula until smooth. 4. 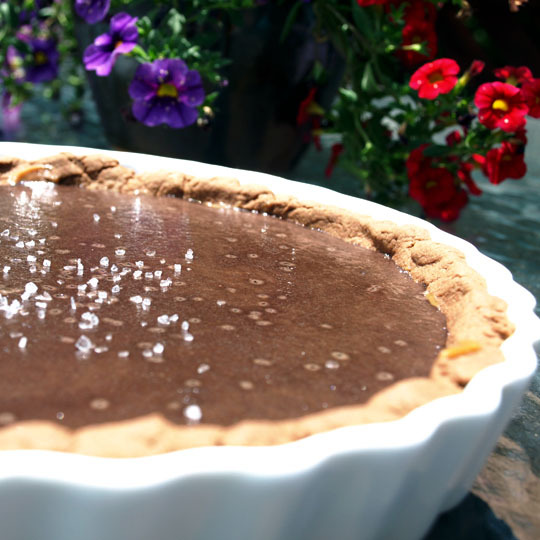 Pour ganache evenly over tart and garnish with sea salt.